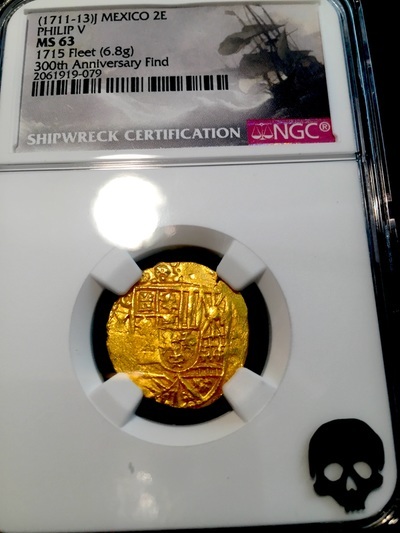 MEXICO 2 ESCUDOS DOUBLOON GOLD COB 1711-13 NGC 63 MINT STATE! 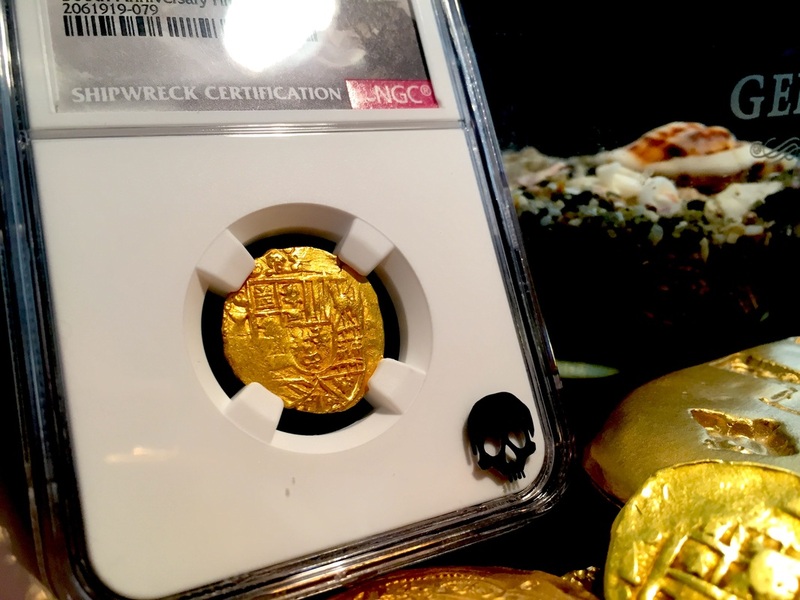 FROM THE 300TH ANNIVERSARY SHIPWRECK DISCOVERY! 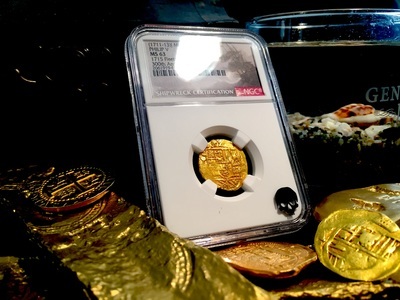 COMES WITH FULL COA AND THE “DIVER’S ARCHIVAL PLASTIC TAG!” THIS PIECE WEIGHS IN AT 6.8 GRAMS AND IS INCREDIBLY ROUND AND DISPLAYING A FULL SHIELD AND MOST OF THE MINT AND ASSAYER AND THE DENOMINATION OF II (TO THE RIGHT OF THE SHIELD). 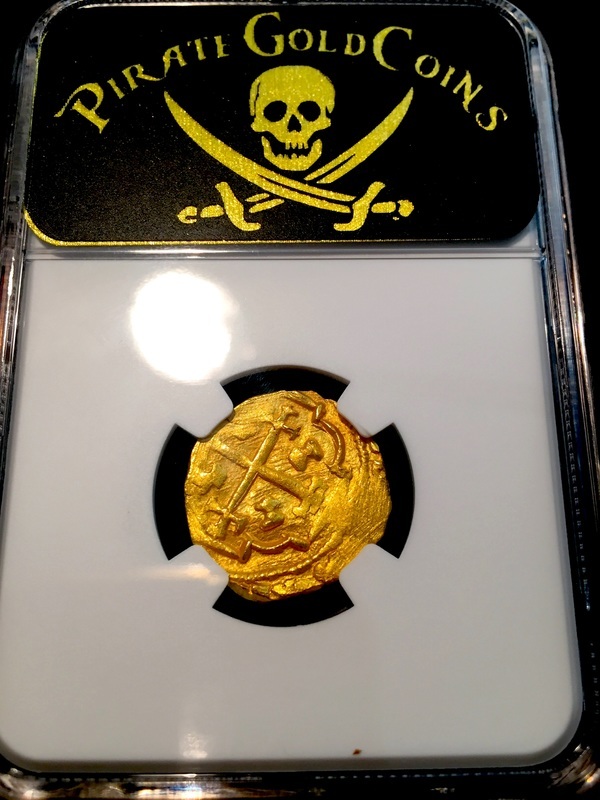 THE RVERSE DISPLAYS A FULL CROSS (OLDER TEMPLAR CROSS OF LORRAINE) AND MOST OF THE SURROUNDING TRESSURE. 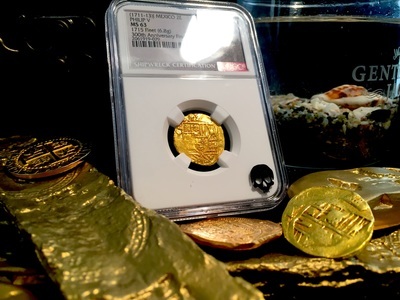 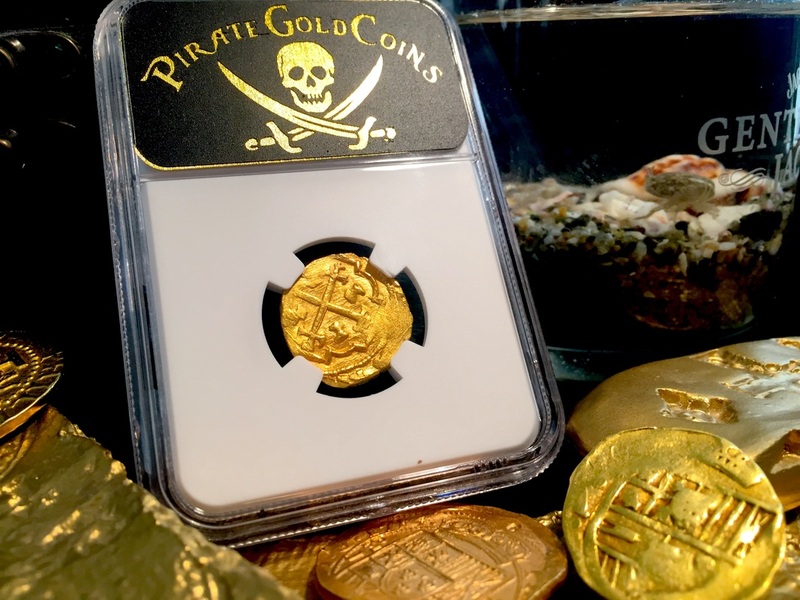 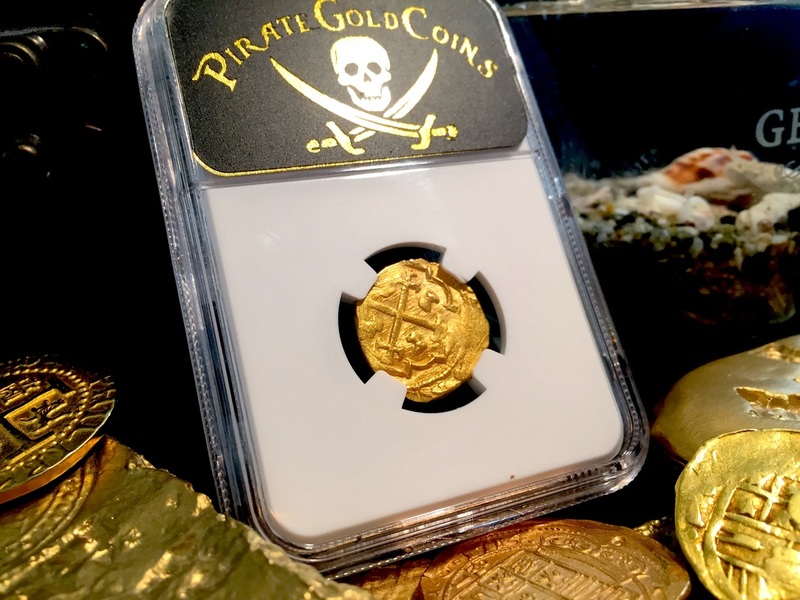 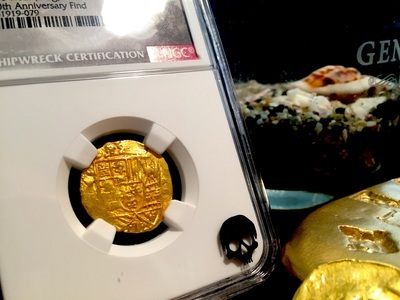 THE GOLD COLOR IS A NICE DEEP RICH GOLDEN LUSTER, JUST AMAZING AFTER BEING AT THE BOTTOM OF THE SEA FOR OVER 300 YEARS!THIS GOLD DOUBLOON IS FROM THE 1715 PLATE FLEET ON THE 300TH ANNIVERSARY DISCOVERY – LITERALLY THE “QUEENS DOWERY"!!! 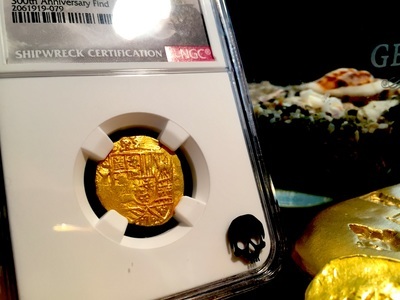 THIS GOLD COB WAS BROUGHT ON JULY 30TH & 31ST 2015, EXACTLY 300 YEARS FROM THE DAY THE 11 GALLEONS PERISHED. OVER 1,000 CREW AND PASSENGERS DIED THAT NIGHT (AROUND 2 AM), BUT OVER 1500 SURVIVED AND SET UP A MAKE–SHIFT CAMP ON THE SHORES (SEE BELOW FOR FULL 1715 SHIPWRECK HISTORY). THIS PIECE IS LITERALLY PART OF THE “QUEENS DOWERY!” KING PHILIP VTH WAS SET TO MARRY A NEW QUEEN (AFTER HE RECENTLY LOST HIS PREVIOUS WIFE TO ILLNESS) AND THE NEW QUEEN WOULD NOT CONSUMMATE THE MARRIAGE UNTIL SHE RECEIVED HER DOWERY. 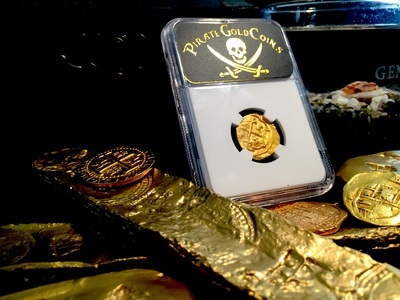 THIS IN CONJUNCTION WITH THE TREATY BEING SIGNED, ENDING THE WAR OF THE SUCCESSION (1701-1714) FORCED THE GALLEON TO SAIL BY ORDERS OF THE KING. 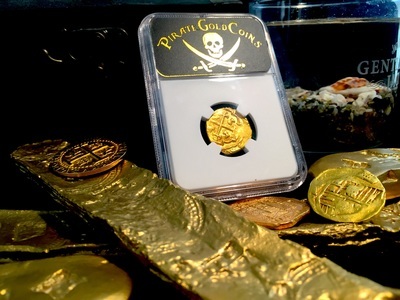 THERE HAD BEEN NO SHIPMENTS OF TREASURE DURING THIS PERIOD (1701-JULY 1715) DUE TO THE HIGH RISK OF BRITAN & DUTCH PIRATES RAIDING THE TREASURE GALLEONS. THIS DISCOVERY (JULY 30TH 2015) WAS AIRED ON “CBS THIS MORNING” SHOW AND ON MANY OTHER STATIONS. 1715 PLATE FLEET 300th ANNIVERSARY"